Steve Howell is thinking big. 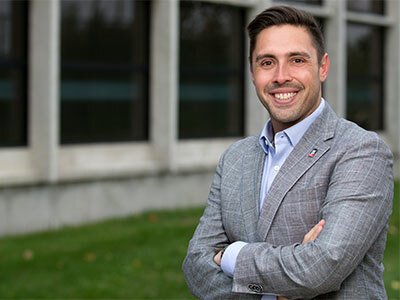 Working with mentor Chad McEvoy, Howell plans to bolster the international alliance between NIU and the University of Tetova in Macedonia by brokering a second dual-degree program between the two schools. 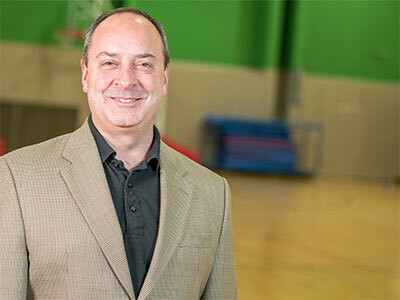 ”Tetova recently partnered and collaborated with the NIU College of Business for a joint degree, and we are interested in doing the same thing but within our Department of Kinesiology and Physical Education,” says Howell, an associate professor of Sport Management. One of six fellows in the College of Education’s inaugural EdLEAD cohort, Howell is making his diplomatic work the basis of his required hands-on leadership project for the 2018-19 academic year. EdLEAD, the College of Education’s Leadership Education and Development Program, is designed to invest in the intentional development of leadership skills for faculty who aspire to take on such positions. Cohort members Mary Beth Henning, Jim Ressler, Kelly Summers, Stephen Tonks, Paul Wright and Howell attended a series of professional development workshops through the spring and summer. That also included a retreat in June that offered a chance to reflect on big-picture issues and to discuss their ideas for leadership projects. Top: Mary Beth Henning and Steve Howell. Middle: Jim Ressler and Kelly Summers. Bottom: Stephen Tonks and Paul Wright. They’ve also identified leaders they admire and consider good mentors, interviewed those people about their management philosophies and shadowed them on the job and in meetings. His project, under the mentorship of Associate Dean for Academic Affairs David Walker, will generate a template for Engage Global. Wright recently led the college’s first Engage Global trip, which took faculty and three graduate students (as well as an undergraduate Political Science major) to Sri Lanka. “The first step of my project was piloting this trip and calling it an Engage Global experience,” Wright says. “I gathered information that we’re going to use to analyze and refine the model, and then we’ll propose the next one – possibly in Belize – for this spring break or next spring break. Mary Beth Henning and Kelly Summers, “Project FIRST: Faculty Integration and Refocusing for Successful Transitions.” Mentor: William Pitney. Jim Ressler, “Physical Education Student Recruitment through Leadership Development in Area High Schools.” Mentor: Laurie Elish-Piper. Stephen Tonks, “Expanding International Student Engagement Initiatives.” Mentor: David Walker. Summers, who teaches in the Department of Leadership, Educational Psychology and Foundations, has found EdLEAD helpful. Project FIRST centers on a personal topic for Summers, the only non-tenured member of the cohort. Junior faculty members receive plentiful mentorship and support for the attainment of tenure, she says, but much of that support dissipates afterward. Project FIRST would offer similar guidance to post-tenure faculty about their professional opportunities, from writing grants and securing journal editorships to pursuing full professor status. For her part, she already is feeling successful thanks to EdLEAD. Howell also has enjoyed his time so far. “It’s been a great experience. Just to talk about the different things that go into the day-to-day operations of a department, a college or a university, with people who are doing these things, is fantastic,” he says. Wright sees in EdLEAD an avenue to build on a prior role. “For a number of reasons, people might bubble up into leadership experiences with no training whatsoever. I speak from experience. I was interim chair of the Department of Kinesiology and Physical Education,” he says. Previous Post:Meet the Dean’s Achievement Scholars!